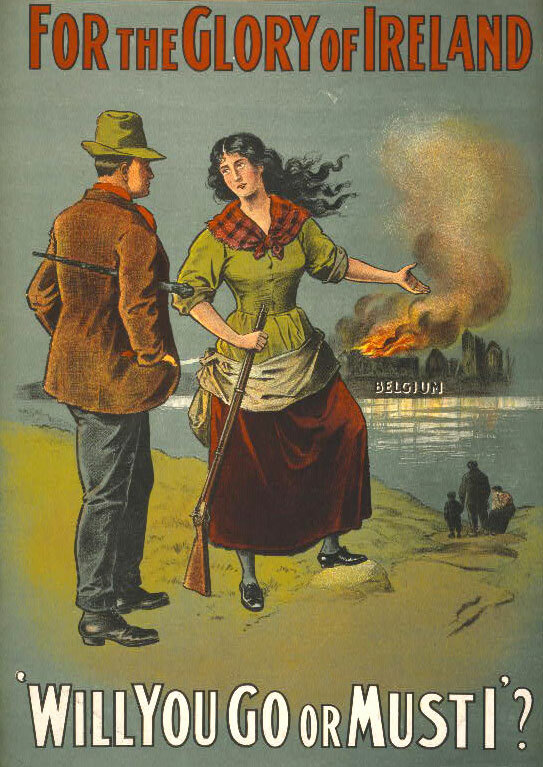 This lithograph, with its unambiguous challenge to Irish manhood, was published in Dublin in 1915. 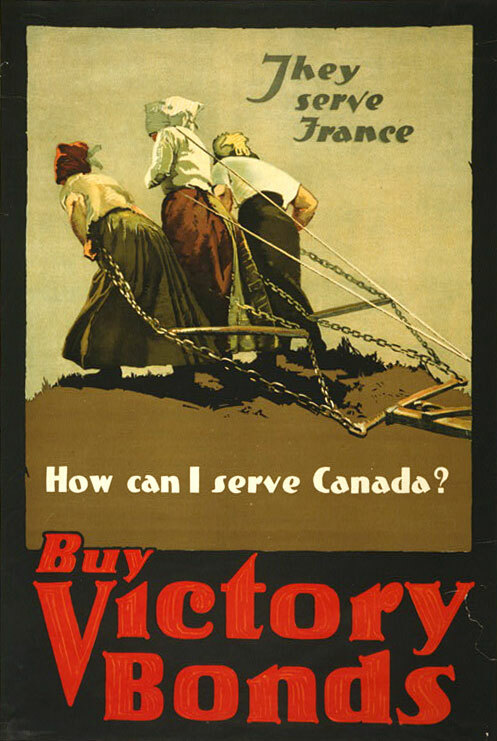 This Canadian poster for Victory Bonds from 1918 takes its source image from a photo by Brown Bros.
A Francis Luis Mora illustration from 1918, published in New York. A Lucien Jonas image from 1918, published by Strobridge Litho. 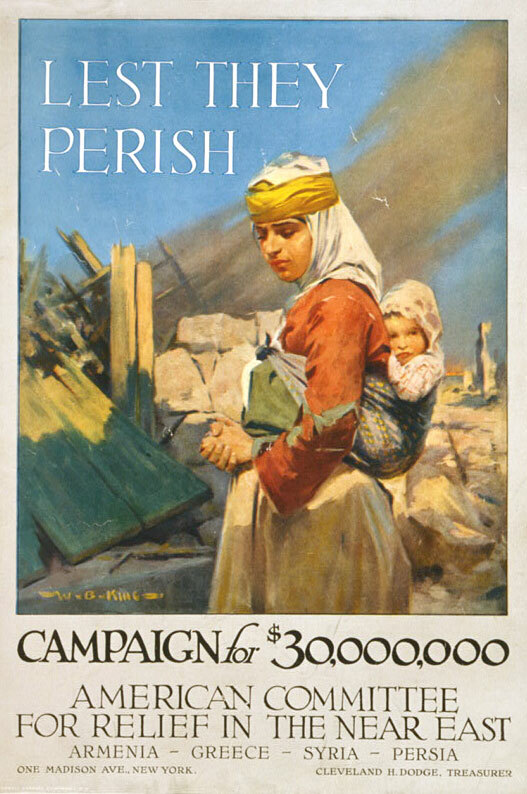 The goal for this fund in 1917 was $100 million. London artist H.G. 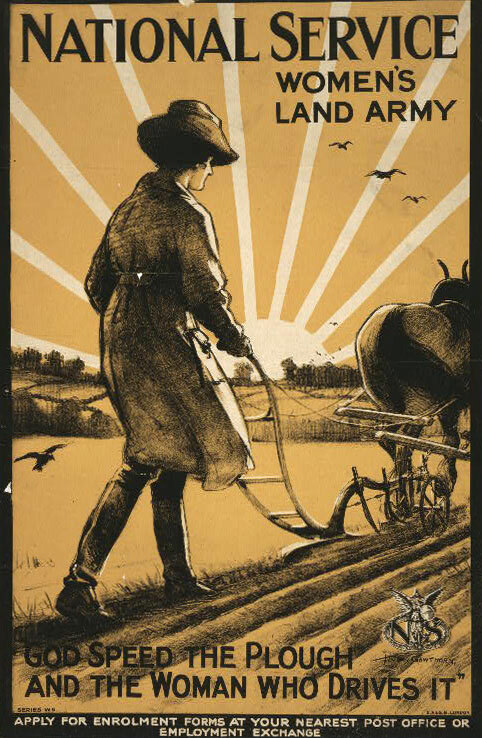 Gawthorn created this 1917 poster. 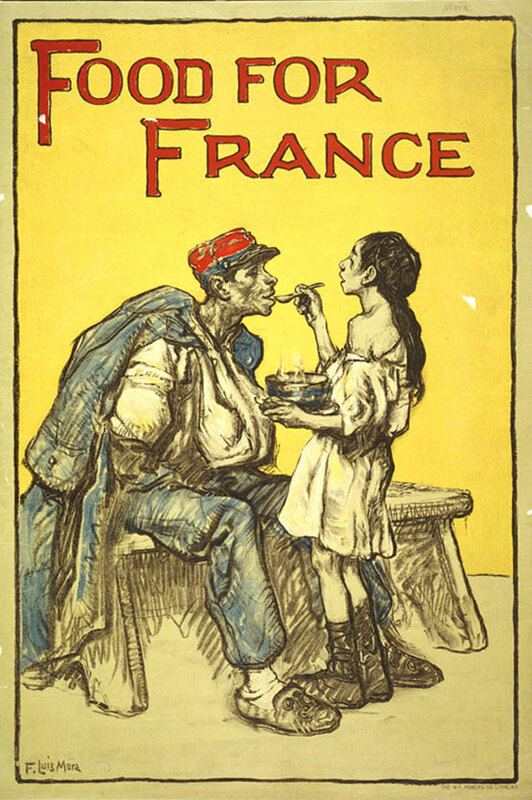 Another British image, this one for the Red Cross by Charles Buchel from 1915. 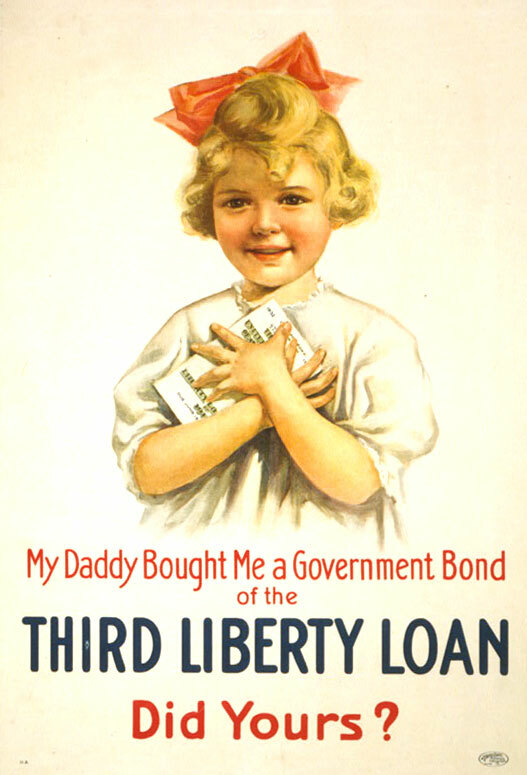 Haskell Coffin produced this image for the U.S. Treasury Department in 1918. W.B. 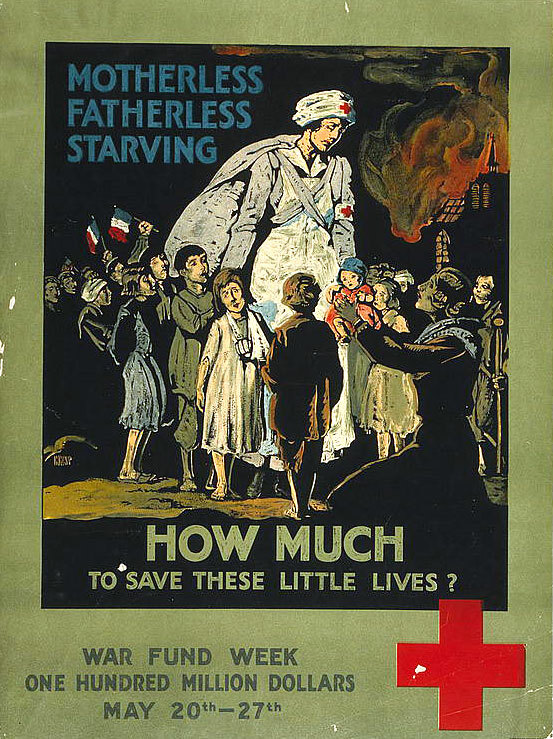 King was the artist for this relief campaign of 1917. 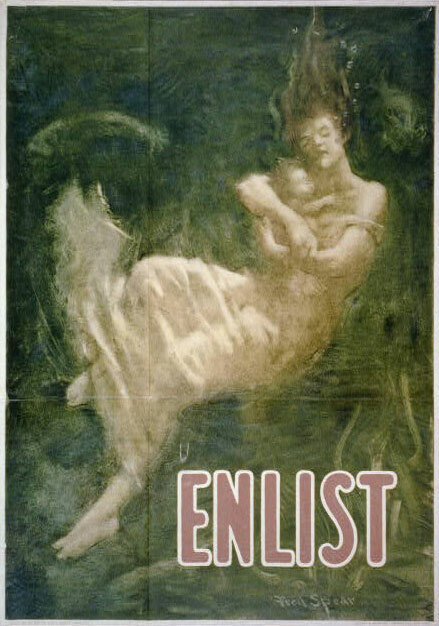 The sinking of the RMS Lusitania by a German U-boat in 1915 sparked outrage on both sides of the Atlantic, as this Boston Public Safety Committee poster of a drowning woman and her child shows. 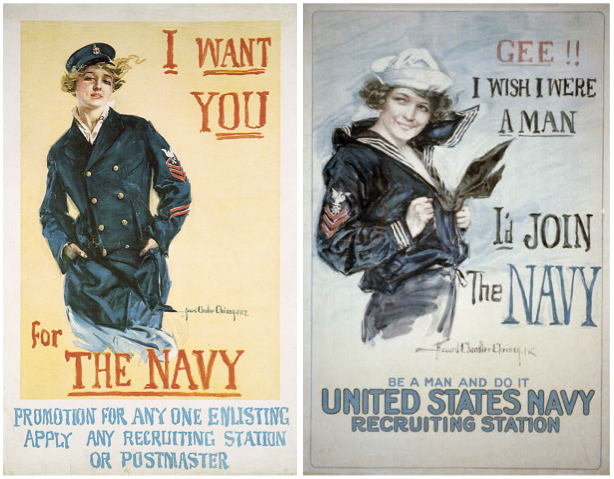 Howard Chandler Christy created two recruitment posters in 1917, each of which used a beautiful woman to entice men into the Navy. 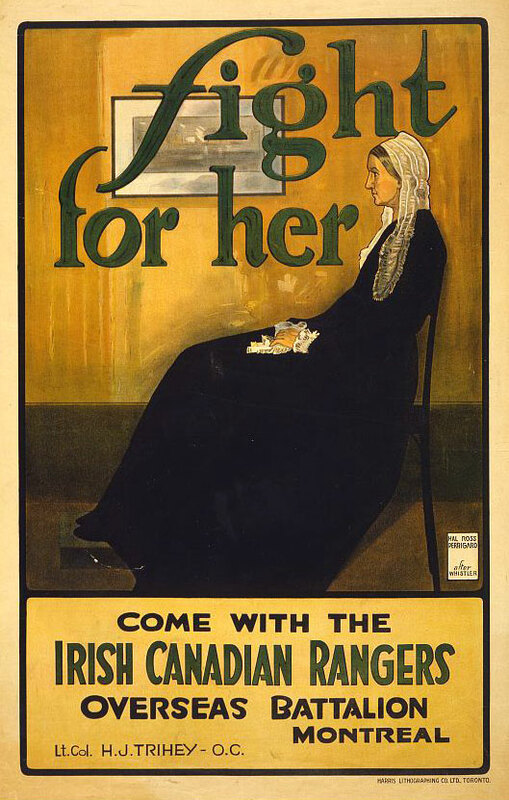 Canadian artist Hal Ross Perrigard gave James McNeill Whistler credit for the inspiration behind this 1915 poster. 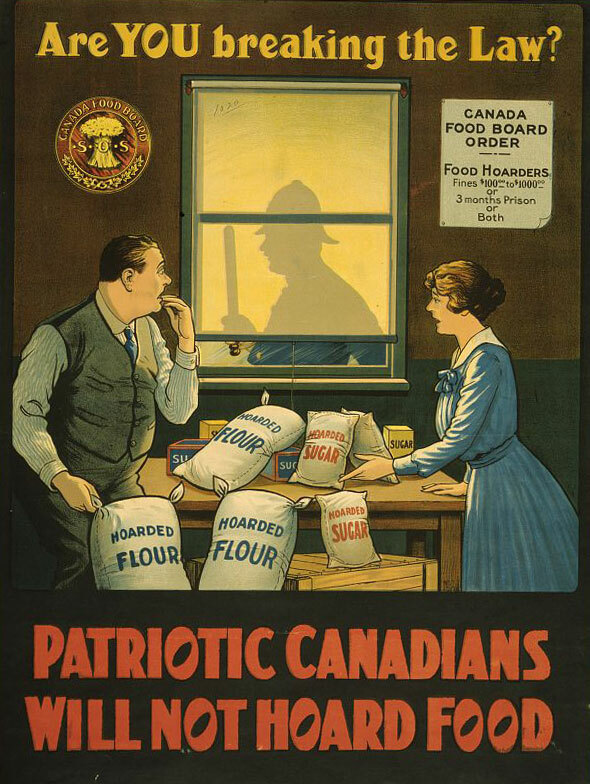 From 1915 to 1918, the Canadian Food Board published posters like this one to discourage citizens from hoarding food. This Charles Dana Gibson illustration of a Jersey girl appeared in "Life" magazine in 1918. 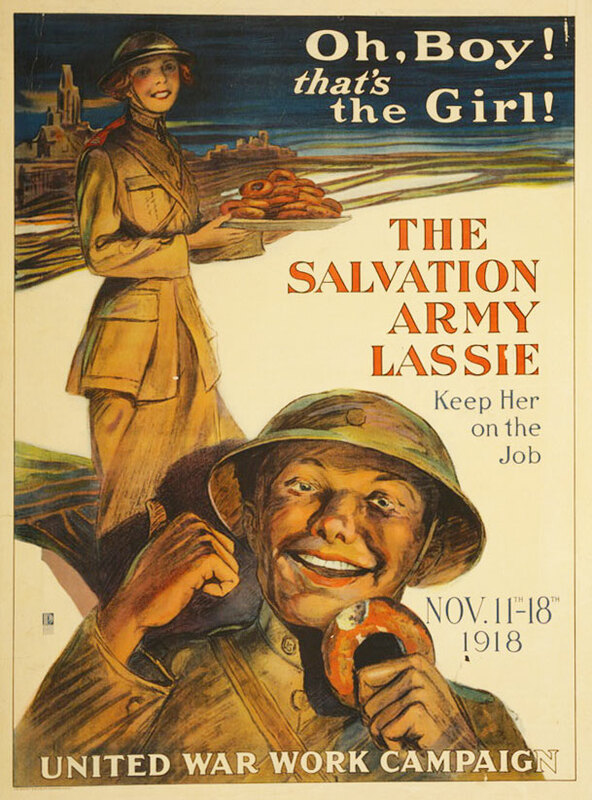 George M. Richards came up with this idealized picture of life on the battlefield for a 1918 United War Work Campaign propaganda poster. 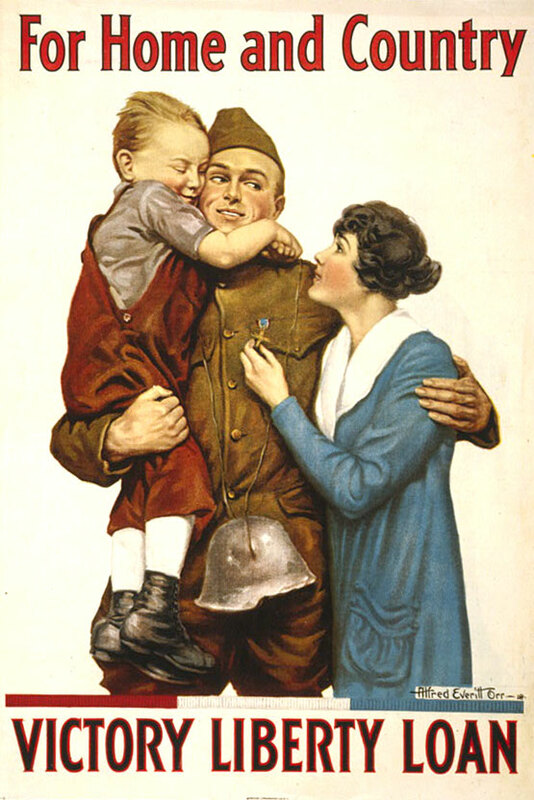 In 1917, this cute little girl could make any father who was not doing his part feel like a heel. 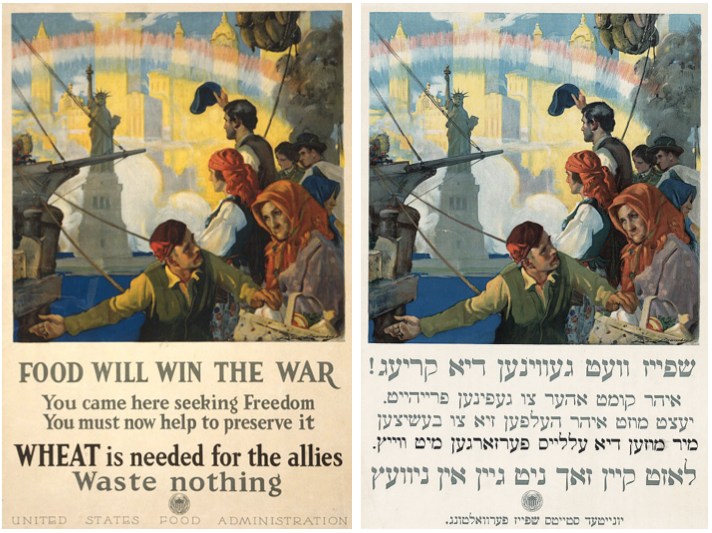 This Charles Edward Chambers illustration from 1917 was pegged at immigrant groups; the poster on the right is in Yiddish. 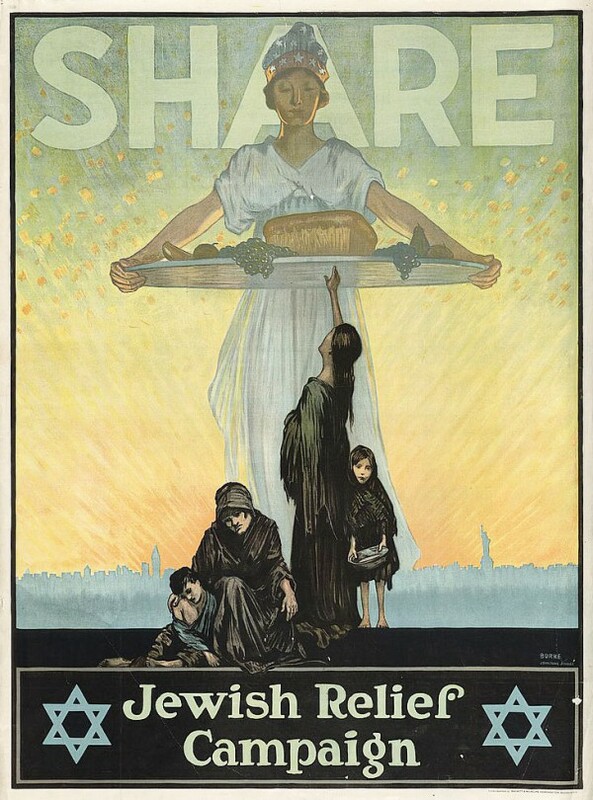 This Jewish Relief Campaign poster was published in Brooklyn in 1917. 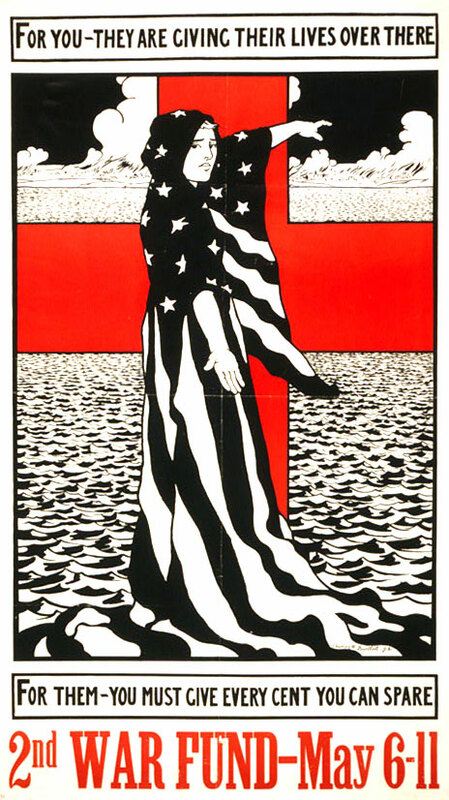 The message of this highly graphic Charles William Bartlett poster from 1918 is clear; your sacrifice at home will never be as great as that of our troops. 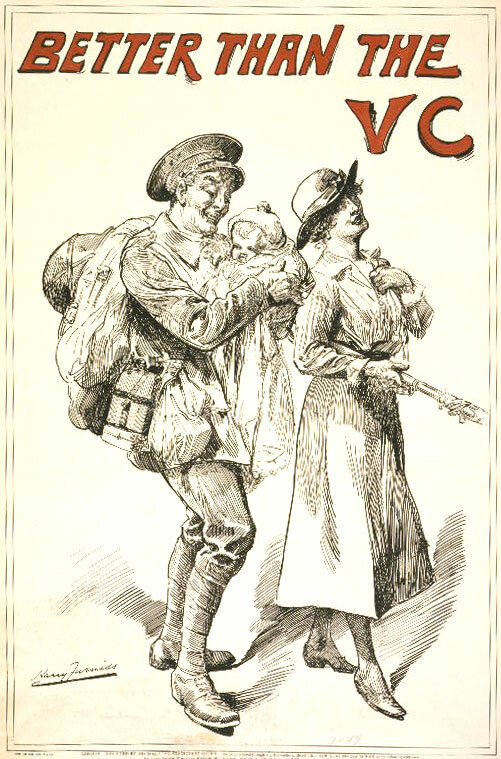 This R.H. Porteous image from 1917 was designed to appeal to mothers concerned for the safety of their sons. 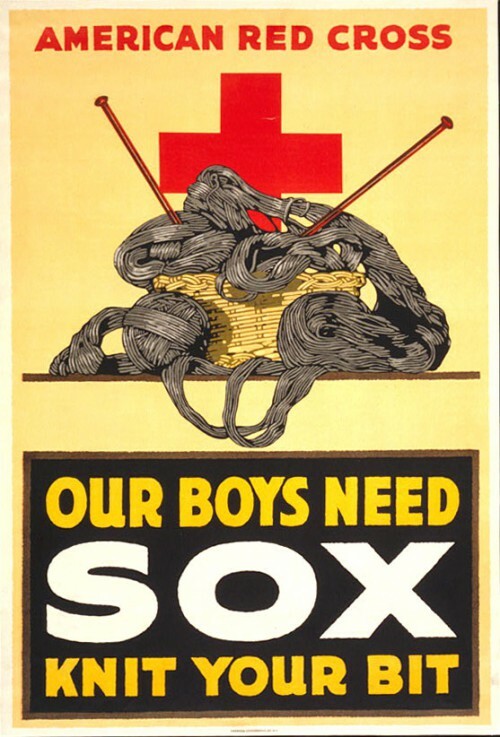 By 1918, the Red Cross was encouraging women to knit socks for "our boys." 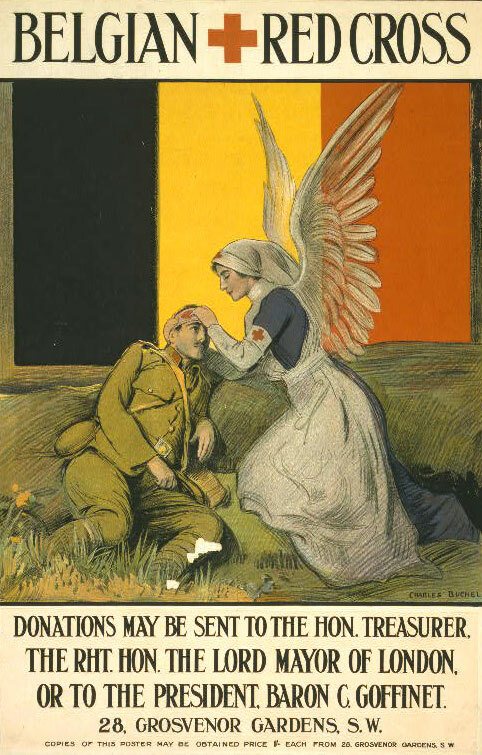 The Victoria Cross, or VC, is the highest award a Commonwealth soldier can receive, but this 1918 British poster suggests that some things are even more important. 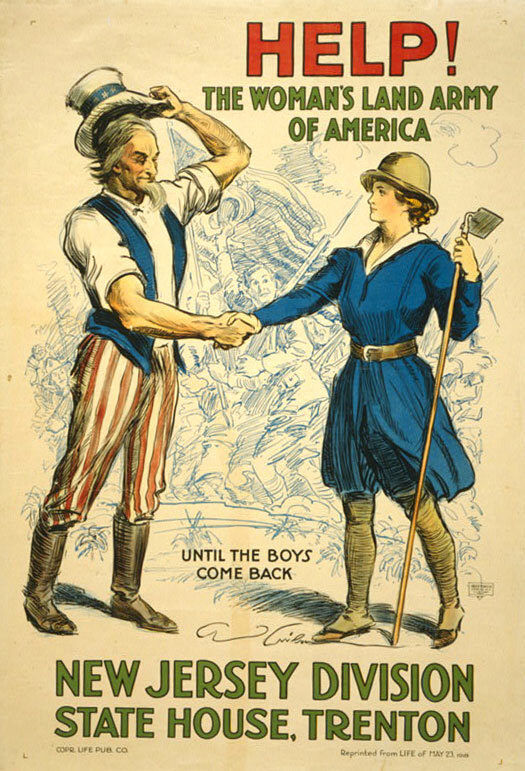 The American version of what we were fighting for, by Alfred Everitt Orr, 1918. 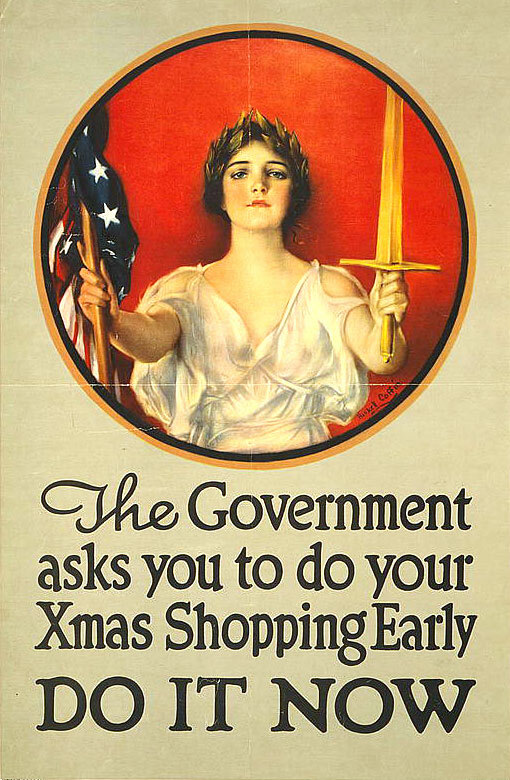 After the 1918 Armistice, Americans were encouraged to shop in order to pump money into the economy, as they were shortly after the attacks on 9/11. Armistice Day is a time to reflect upon that defining moment at the end of World War I, at 11 a.m. on November 11, 1918, when soldiers stopped shooting at each other along Europe’s Western Front. At its close, most observers assumed that nothing would ever match the “Great War” for its sheer volumes of death and destruction, and for decades after, people around the world stopped whatever they were doing at that hour to observe two minutes of silence in a mute echo of the quiet that must have blanketed the battlefield. As the world soon learned, the sadly quaint practice of holding one’s tongue for 120 seconds, once a year, would not be enough: After World War II, the holiday’s name was changed in the United States to Veterans Day, while countries in the British Commonwealth observed Remembrance Day. 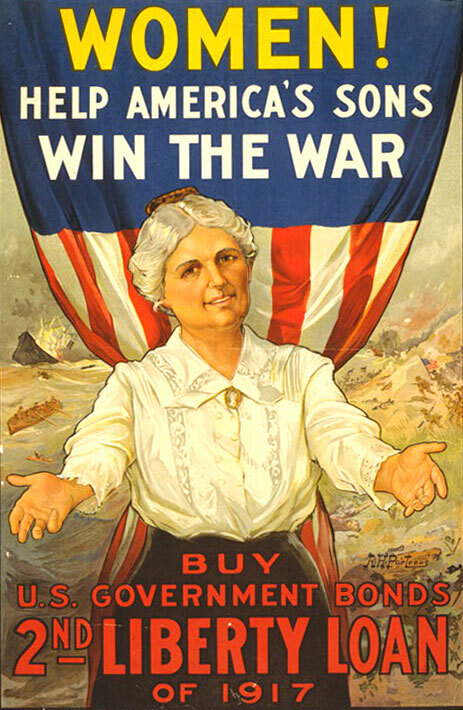 Looking back on the recruiting posters from that war, it’s interesting to note how portrayals of women and children, as well as the comforts of home, were used to essentially guilt-trip able-bodied men into enlisting for a tour of duty in the trenches. 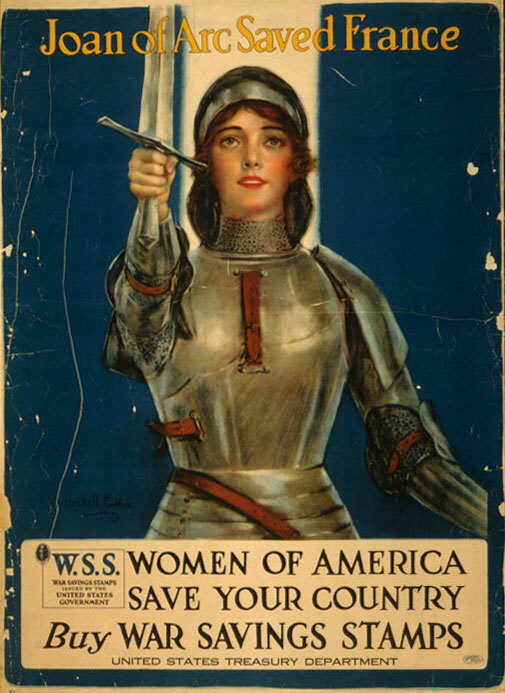 In the United States, women were generally depicted as the ones who’d keep the home fires burning while their sons and husbands were fighting the good fight “over there.” Less passive were the depictions of women in France, whose sacrifices were often used to literally shame men into doing their duty. 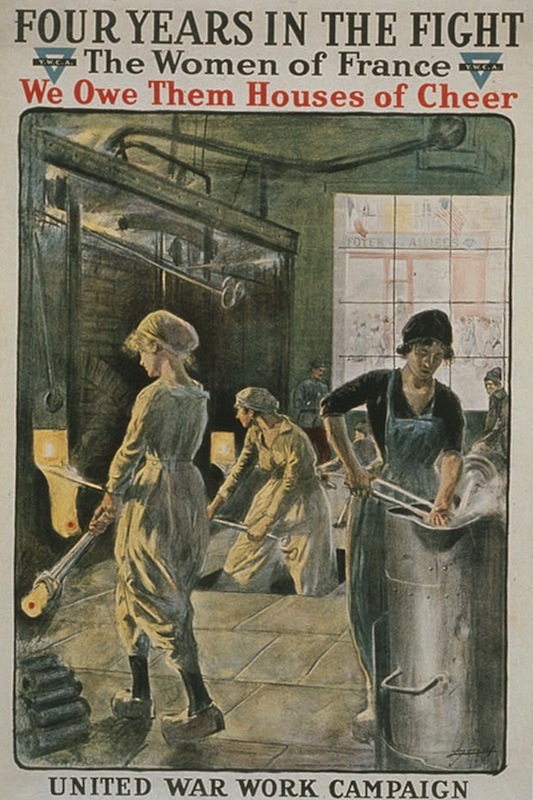 In retrospect, the portrayal of World War I-era women is not as glamorous as that of the Rosie the Riveters in World War II, but their role in the conflict from a propaganda standpoint was every bit as vital to the war effort, as shown in these posters from the U.S. Library of Congress. Great group of posters. I’m reblogging this for Veteran’s Day. Fascinating. The Enlist one I was familiar with, but many of the others I had never seen before. Just shows how the lies are still the same. The wealthy conning the poor to die in order to maintain the wealthy in their mansions. Wonderful posters, but I cannot see anyone wanting to defend the EU in the same way these days. My question would be to keith b … are you or have you ever served your country … because my father served in WWI and WWII, and my husband served some 3-1/2 yrs. in the jungles of the Philippines during WWII, and I resent your comment about the “wealthy conning the poor to die” … these brave men chose to defend their country, WHEN THERE WAS A DRAFT, just as the young men and women do today … WHEN THERE IS NO DRAFT, BUT A VOLUNTEER SERVICE. Sorry Nana, I’m with keith b on this one, wars emerge when the private super rich want something from another country, and use trade wars, sanctions then hot wars to get it. They shamed people in the olden days into leaving their families and going off to kill someone that they’d probably get on very well with. Now that there’s no deference, they just do it anyway. Iraq 03. Drill down, you’ll find most wars are about finance and resources. “ ” The whole point was pretty much to get together, get drunk, and get laid. That’s the real history of rock ’n’ roll.